Have you ever seen some professional website or blog have their own Android App? You can make it too. AppYet is a easy and free tool to help your create Android App for your small website or personal blog. Just few steps and you will get a beautiful Android app for your website. 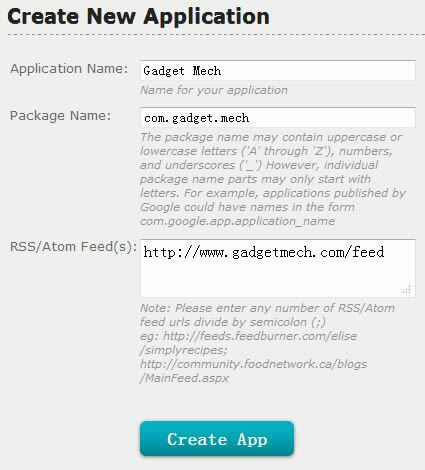 AppYet is a free online tool to build Android Apps for website by grab RSS feed from website of blog. AppYet don’t require any coding experience. Just input some basic information and it will build an Android app. 2. Input details as suggested. 3. The next page you need to configure the new app. You can set a custom icon, like you website icon, for Android App. 4. Click “Add new feed” if you need to add other websites or blog. Go to your email account and download the apk file. Install it on your Android phone. The picture below is a preview of IT Geeg on Android phone. 1. It may takes a litter more time to download article list the first time you open the new app. 2. Free AppYet app will insert ads. These ads are authorized by AppYet. You can’t remove them. 3. There are no custom setting for free version.